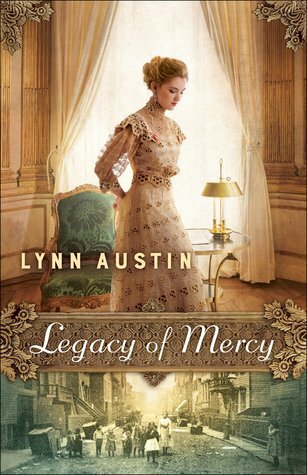 Legacy of Mercy (2018) by Lynn Austin is the second novel in her Waves of Mercy series. This book comes in all forms including eBook, and is 400 pages in length. With a full-time job and a very busy six-year old at home, this novel took me three days to read. I received a copy of this book in paperback form from the publisher, Bethany House Publishers. In no way has this influenced my opinion of the story. All opinions expressed in this review are my own. I give Legacy of Mercy 5+++++ STARS. This story is a Christian Historical novel. There is so much I love about Legacy of Mercy that I cannot possibly fit it all into one review. This book is just SO deep and exquisite! The plot of this story is excellent — once I started I could barely put the book down. I was so thoroughly engrossed in the story that pages flew by and hours passed and I didn’t even realize it. The characters are well crafted, and they all endeared themselves to my heart in one unique way or another, but my two favorite characters are Judge Blackwell and Dominie Den Herder. Judge Blackwell is sweet and heroic, and his story ripped my heart into pieces. And Dominie Den Herder is tough, stubborn, and all-around awful, but his transformation from lost to found (Biblically speaking) is so excellently done that I cried tears of joy! Oh! And the settings are remarkably written. Each place is so vividly described I felt like I was with Anna and Derk in a Chicago slum, like I was with Anna and her parents at a party in one of Chicago’s elite family’s mansions, and like I was with Oma Geesje in her warm, friendly home in Holland, Michigan enjoying a cup of tea and much-needed advice. This book definitely took me on an adventure! Legacy of Mercy is full of excellent Truth moments. I feel exceptionally encouraged after having read this book! Of the many excellent messages delivered, my most favorite is a lesson from Oma Geesje. There is a moment where Geesje contemplates a new move, but the idea isn’t initially pleasant. She is 67 and quite comfortable where she is at. But then she realizes that “perhaps God doesn’t want [her] to get too comfortable. Maybe change is His favorite tool to make sure [His people] keep growing closer to Him” (389). What a wonderful perspective! I’ve always looked at change as a negative inconvenience. I am ashamed to admit that I’ve never really seen change in a positive light. Oma Geesje’s epiphany has convicted me to change my outlook — instead of seeing it as a burden, I need to see change, both good and bad, as yet another opportunity to be closer to my Heavenly Father. I need to stop being a complainer and whiner when changes in my life occur. I need to be more like Oma Geesje! Anna, the heroine of Legacy of Mercy, is lovely. She is everything a well-written heroine should be, but what I appreciated the most about her character is her faith in God. Anna, as a new follower in Christ, has the kind of faith that moves mountains. She isn’t too sure about all the things she’s reading in her Bible, but she is a fighter for God. I love that she is desperate to be the woman God wants her to be in the place God has put her. My favorite moments in the book come right after Anna has read her Bible. In these moments, she questions what God means in order to understand, and then always tries to put God’s Words into action no matter what. Her upper-class social sphere does not include too many women of faith like her, so when she begins to make changes to her life and sticks to her guns about living for God’s purpose some of her “friends” become catty and rude. Regardless, Anna suffers the stings of her friends’ disdain because she has given her life to God and not to her society. Anna’s strength in her faith and her drive to understand God’s purpose for her forced me to self reflect and question the depth of my faith. Do I stand up to my friends and politely ask them to stop gossiping about others, or do I join in? Do I appreciate all of my blessings, or do I constantly find things to complain about? Do I represent Jesus well even if that means going against the tide? I have to admit that I came up short and had to make an apology to God for my laxity in faith. I adore when a novel forces me to look within, and then make appropriate change in order to better my walk with God. Legacy of Mercy is brilliant! This is a story that will stick with me long after the final page has been read, and will go onto my re-read pile immediately. Legacy of Mercy is highly engaging, the characters are multifaceted, endearing, and unique, and the lessons in this book are invaluable — several have breathed new life into Biblical principals I thought I knew well already. I highly, highly recommend this book! Purchase a copy today. You will NOT be disappointed. Thank you! I hope you can get to it soon. It is so good. Wonderful review, Nicole!! I too loved this book for so many reasons. You captured the essence so well.